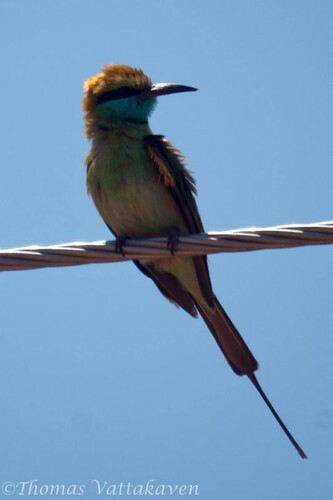 The Green Bee-eater, (Merops orientalis), is also known as the Little Green Bee-eater. 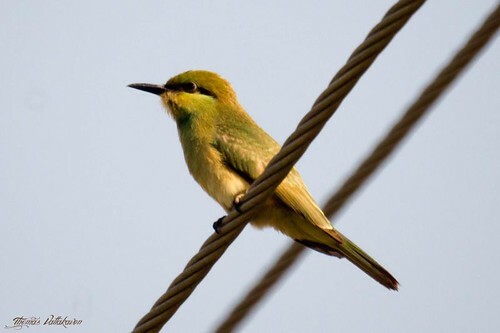 It is an abundant bird found across India and is most likely to be encountered sitting on an electric wire. 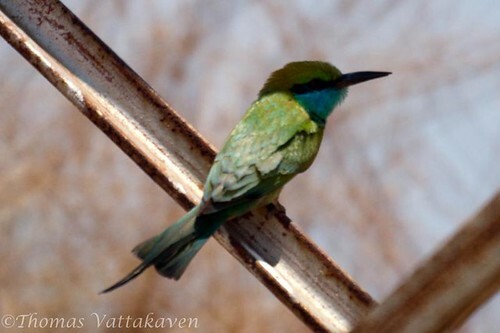 The plumage is bright green, tinged with blue in some places, especially under the chin and throat. The crown and upper back are a golden rufous colour. A prominent black line runs through the eye. 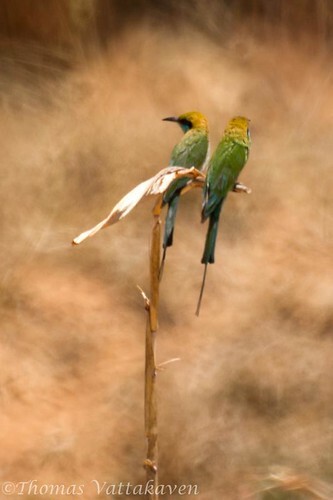 The two central tail feathers are elongated and are long and pointed. 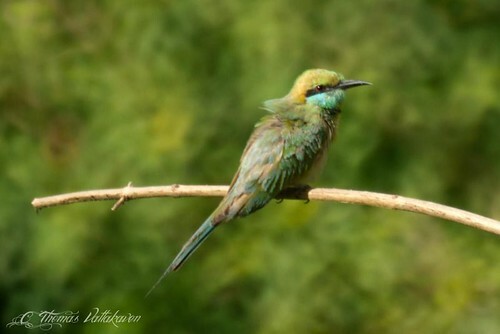 Juveniles, though lack this elongation (below). The iris is blood-red, the beak is long, slender and curved and black and the feet are a blackish brown. 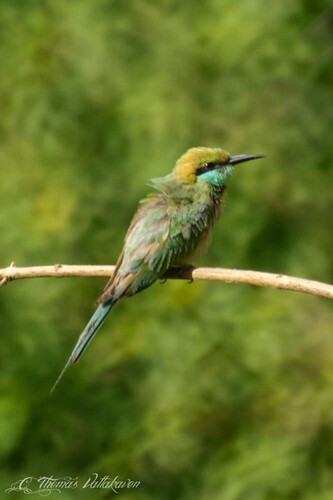 These birds avoid heavy forests and frequent open countryside. They have feeble feet and cannot walk or hop and therefore they rarely visit the ground. 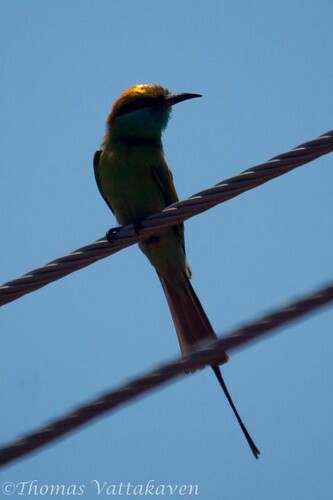 They can usually be seen perched on wires, bushes and trees. 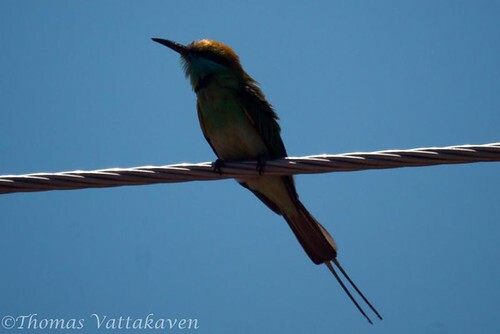 From its perch it sets out on a sally to catch insects and returns with its prey to the same spot. The insect is then battered to death before being eaten. 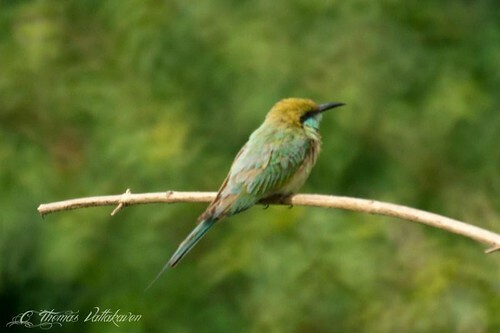 The breeding season lasts from middle march until June. The eggs are laid in a chamber in the ground reached by a long tunnel, usually in the a perpendicular face of a bank or cutting. The egg is laid in the chamber without additional nesting material. Three to five eggs are laid. 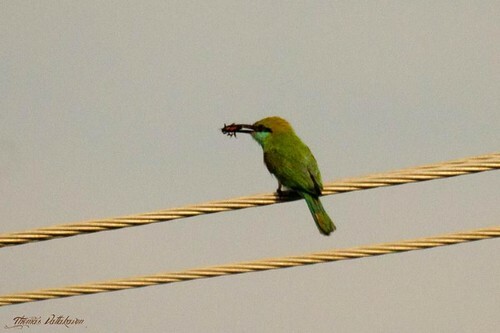 Other Details: Seen in flocks of at least 3 or more birds.